Send 12 Mixed Roses in Vase to Chennai. Gifts to Chennai. Send Flowers to Chennai. 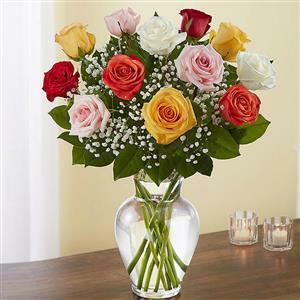 Description : These beautiful 12 mixed Long Stem Premium Roses presented with gypsophila in a vase will certainly brighten your loved ones home or office in Chennai. Accented with greenery, these will surely bring a big smile on your dear ones' faces. Moreover, Gift2Chennai.com ensures a safe and secure delivery of your Gifts to Chennai.